Download the NEW A&L Motors App!Use our App to Schedule Your Next Service Appointment Today! Use the New A&L Motor Sales DealerApp for Easy Service! Our goal here at A&L BMW is to always simplify the automotive process for our customers in any way that we can. That's why we're extremely excited and proud to announce our new smartphone app: The A&L Motor Sales DealerApp! Here, you'll be able to schedule service appointments at the touch of a button, view our inventory with a few clicks, find all the contact information you could need for our staff and much, much more. 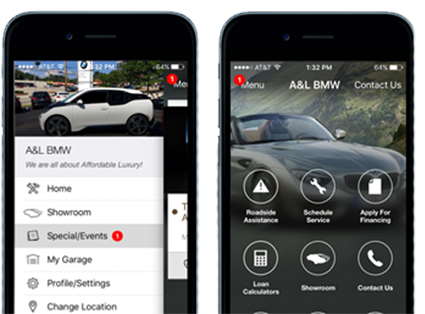 This mobile app will hopefully streamline the shopping process for you, regardless of what it is you need from our BMW dealership near Pittsburgh, PA! The app features a simple, easy-to-use interface so everyone can find their way around, but our staff would be happy to assist you in person if you need technological guidance. The A&L Motor Sales DealerApp can be downloaded from iTunes and Google Play, so there's a good chance you can get it right away by going through your smartphone's app store. It's completely free of charge and is simply available to help enhance your experience. If you're ever left stranded on the road and need help or you have a minute at work to browse our new-BMW specials, all you have to do is pull up the app. We hope this new perk will make managing your driving lifestyle that much easier!